Location: near Poas Volcano National Park - 1 hour drive from San Jose. 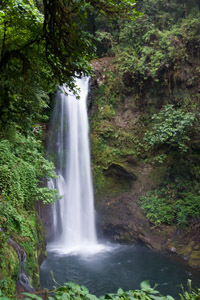 Highlights: 5 waterfalls up to 121 feet high, gardens, rainforest, wildlife, walking trails, tours. Fed by River La Paz after traveling 8 kilometers through volcanic terrain and rainforest, the 37 meter high waterfall is sure to delight visitors. Wildlife and fauna abound at the La Paz Waterfall Gardens — monkeys, birds, snakes, jaguars, frogs, ocelots, sloths snakes & butterflies and others to top over 100 species. Enjoy wonderous hiking through the 3.5 kilometers of walking trails throughout the park. The gardens are primarily a self-guided tour however, information-packed guided tours are also available. Open year round from 8:30 a.m. to 5:30 p.m. and reservations are not necessary. You should plan 1.5 hours for your visit. However, if you would like to see every trail, a whole day may be more appropriate. Includes: transportation from San Jose, buffet, guided tour.